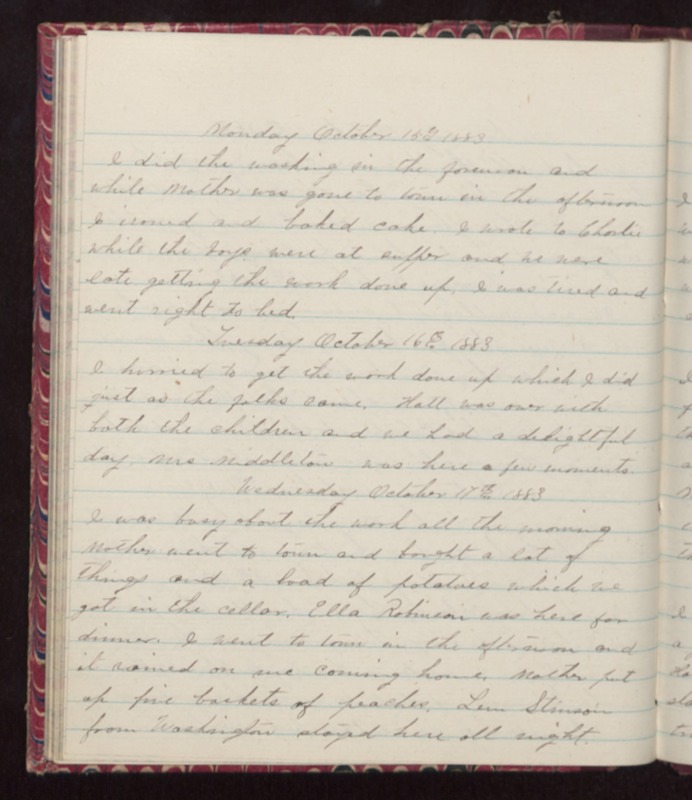 Monday October 15th 1883 I did the washing in the forenoon and while Mother was gone to town in the afternoon I ironed and baked cake. I wrote to Charlie while the boys were at supper and we were late getting the work done up. I was tired and went right to bed. Tuesday October 16th 1883 I hurried to get the work done up which I did just as the folks came. Hatt was over with both the children and we had a delightful day. Mrs Middleton was here a few moments. Wednesday October 17th 1883 I was busy about the work all the morning Mother went to town and bought a lot of things and a load of potatoes which we got in the cellar. Ella Robinson was here for dinner. I went to town in the afternoon and it rained on me coming home. Mother put up five baskets of peaches. Lew Stinson from Washington stayed here all night.